President Obama congratulates Mel Watt at the White House on Wednesday after nominating him to be the next director of the Federal Housing Finance Agency. The next head of the Federal Housing Finance Agency will have quite the task waiting. 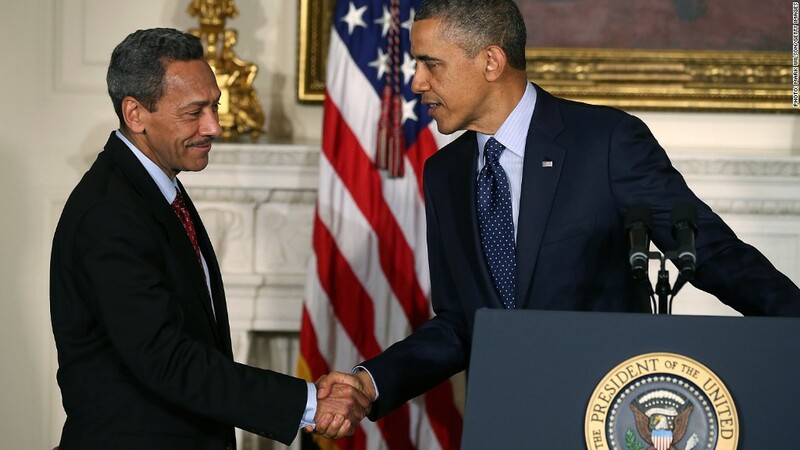 President Obama nominated Mel Watt, a Democratic congressman from North Carolina, this week to be the next head of the FHFA. Should Watt be confirmed by the Senate, he will play a critical role in shaping the future of the U.S. housing market. Ever since the crisis hit in 2008, the FHFA has been in control of housing finance giants Fannie Mae and Freddie Mac, which own or guarantee more than half of all outstanding mortgages in the U.S., according to the Congressional Budget Office. "This position is far more than just a regulator," said Bartlett Naylor, a financial policy expert with the advocacy group Public Citizen. "Anyone with a mortgage intersects with Fannie and Freddie and therein with what Mel Watt will be responsible for at the FHFA." At the top of the agenda for the FHFA is the question of whether it will reduce loan balances for struggling borrowers whose mortgages are backed by Fannie and Freddie. The outgoing head of the agency, Ed DeMarco, has opposed calls from the Obama administration and progressive groups to move ahead with such reductions. DeMarco has argued that principal reductions would shortchange taxpayers and could prompt borrowers who are current on their mortgages to deliberately fall behind. Supporters of principal reductions say they could help stabilize the housing market and give the economy a boost. A study released this week by the CBO argued that the government could actually save money through an expanded principal reduction program because it would reduce the number of defaults and foreclosures. Some 1.2 million borrowers could be eligible for some form of principal forgiveness, the CBO said. The Obama administration has tried to help underwater borrowers -- those who owe more than their homes are worth -- through the Home Affordable Modification Program, or HAMP. But that initiative has been limited in its effectiveness over the past few years, securing principal reductions for less than 120,000 borrowers as of the end of 2012, and it limits such reductions to mortgages that aren't controlled by Fannie and Freddie. Some on the left have questioned Watt's independence in view of the substantial campaign donations he's received over the years from banks and other financial institutions. But he has also received large contributions from unions, and his nomination had drawn support from progressives -- including Massachusetts Senator Elizabeth Warren, AFL-CIO head Richard Trumka and advocacy group MoveOn.org -- who have praised his efforts in Congress to protect consumers. Watt's confirmation process may still be contentious. Republican senators Bob Corker and Mike Crapo expressed concern about his nomination this week, calling on the Obama administration to articulate a plan for reducing government involvement in the housing market going forward. That will be no easy task. Back in 2006, just 30% of new mortgages were backed by the government, according to Inside Mortgage Finance. But as the housing sector cratered, private capital fled the market and the government's role expanded. In 2012, more than 86% of new mortgages had government backing. Fannie and Freddie -- known together as the GSE's, or Government Sponsored Enterprises -- sustained massive losses as the housing market went bust, requiring taxpayer bailouts that swelled to more than $187 billion. The companies have since paid the Treasury Department nearly $60 billion in dividends as they've returned to profitability, but it's unclear when they'll be completely free of their obligations and how they'll be managed in the future. "What are the GSE's going to look like going forward and are we ever going to wean ourselves off of public money for mortgages and have a truly robust private mortgage market?" said Richard Green, director of the Luck Center for Real Estate at the University of Southern California. "Everybody agrees that we need to do something about it, but no one can come to agreement on it, so the new director faces a pretty large challenge as he tries to fix this."